I always found excuses for my poor diet and nonexistent exercise habits. With two children and a busy life, I was tired. Money was tight. I liked to cook and entertain–and I had an old neck injury from a car accident. By my mid-40s, a decade of sloth and second helpings had piled on an extra 40 pounds. 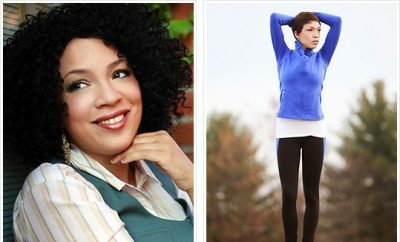 My weight problem made me increasingly unhappy: I avoided mirrors, I felt listless, and every night, as I pulled up the sheets, I felt sad and disgusted and resolved to do better the next morning. But I didn’t do better. After several unsuccessful diets, I gave up and blamed my ballooning shape and waning energy on age. Instead of changing myself, I bought clothes that hid my flaws. When my 19-year-old daughter, Laura, came home from college in 1999 and said, “Mom, let’s join a gym,” I knew my disguises weren’t working. She has my body type, and I realized that my bad example might be setting her up to have weight problems in the future. I didn’t want Laura to see me as lazy and unable to achieve my goals. Instead, I wanted to be a positive role model for how to be fit and healthy. Eye on the Prize Laura and I joined our local gym that summer. I started with the low-impact aerobics class, which was harder than I’d expected. I struggled to keep up and would start crying when I saw myself in the gym mirrors. But I needed to keep going for Laura. So I went 2 or 3 days a week and fixed my eyes on the instructor as a way to focus on my goal. Within a few weeks, I felt healthier and began to have more energy. My neck pain even stopped flaring up. After 9 months, however, I had lost only 3 pounds. It was very discouraging. But my husband pointed out that if I was typically gaining almost 5 pounds annually and now had dropped 3, I had really lost 8 pounds. His sunny outlook kept me motivated. With renewed determination, I searched for other changes I could make. I’d heard about the benefits of strength training, so once or twice a week I’d leave the safe confines of the aerobics area and use the resistance machines. I also realized I couldn’t ignore my poor eating habits any longer. But instead of dieting, I stopped eating second helpings and was careful not to eat too much fat or sugar. I switched from baking every week to making cakes or cookies only when we entertained–and the leftovers went home with the guests. During the next several weeks, I lost 2 more pounds and began to think weight loss might not be impossible. Then I plateaued again. 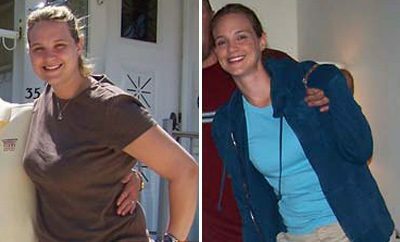 Laura was getting married in 2 months, and I really wanted to lose more weight before the wedding. Desperate for results, I spoke with the gym manager. He suggested I work out with a personal trainer. I thought, How frivolous! We had one child in college and another one almost there, and we had to pay for a wedding. My husband is a minister; we’re supposed to be frugal. What would the church community think? But the suggestion stuck with me, and since the first two sessions were free, I decided to try it. It was one of the best choices I ever made. I worked with Eddie, my trainer, twice a week (my family bought me more sessions as birthday and Christmas gifts). He wasn’t at all judgmental or intimidating, as I’d feared. He just helped me find a program that worked. We focused on upper body, abs, and cardio one day and lower body, abs, and cardio the next, doing four sets of 16 reps of each strength-training exercise. Being accountable to Eddie made me more dedicated to getting to the gym regularly, and he pushed me harder–though not too hard–than I ever would have pushed myself. By the time the wedding rolled around, I had lost another 10 pounds. It felt great to hear people tell me how beautiful I looked and that they couldn’t believe I was the mother of the bride. I kept working out 4 or 5 days a week and losing weight. 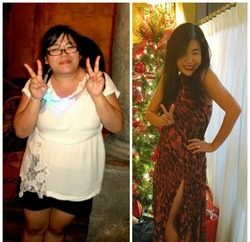 At the 2-year mark from when I’d started, I had lost 40 pounds, gone from 38 to 25% body fat, and dropped from a size 16 to an 8. I’m proof that perseverance pays off. Student Becomes Teacher During the next year and a half, I decided to help other women who were struggling like I had been. A few of the instructors at the gym suggested I get certified to teach aerobics. I sent away for the textbook, studied for several months, practiced with supervision, and finally took the test to be a certified instructor. Today I teach at my gym, and I’m the one bugging my daughter to work out. My husband calls me his bionic babe. Eddie calls me “Turbo.” Friends call me Wonder Woman. I call myself content. Making exercise a daily discipline has brought balance to my life and given my daughter a healthy example to follow. And that’s the greatest reward of all.